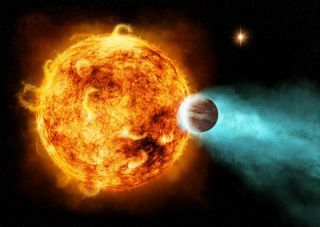 Artist's conception of a hot Jupiter. A new study suggests these massive planets could grow in size over their lifetimes, thanks to radiation from their parent star. Giant planets that orbit near their stars can grow even bigger as they age, a new study finds. This finding could shed light on how planets interact with their stars, researchers say. Previous research has found a growing number of exoplanets that are larger than expected based on theoretical models of planetary formation and evolution. It might be that these planets aren't born extra-large, but instead are puffing up over time like hot-air balloons because of heat radiating from their stars. "The size of a gas giant planet is primarily set by the heat in the deep interior of the planet, and since these planets are not generating [new] heat internally, you would expect them to cool and contract over time," said study lead author Joel Hartman, an astronomer at Princeton University. "The only way they can be getting bigger over time is if some of the radiative energy from the star is somehow making its way deep into the planet and heating it." To help solve this mystery, scientists examined two newfound hot Jupiters named HAT-P-65b and HAT-P-66b. They were discovered using the Hungarian-made Automated Telescope Network (HATNet) in Arizona and Hawaii. These exoplanets are about 2,745 and 3,025 light-years from Earth, respectively. Both orbit stars that are a little more than 1.2 times the mass of the sun, and these exoplanets circle their stars at distances about 10 times as close as Mercury does the sun. Although HAT-P-65b and HAT-P-66b are only about 0.5 and 0.8 times the mass of Jupiter, they are about 1.9 and 1.6 times the diameter of Jupiter; that means these planets are unusually puffy for their mass. They are among the largest hot Jupiters known. The researchers compared these enlarged gas giants with more than 200 other exoplanets that closely orbit their stars. The researchers found that oversize exoplanets are often located around older stars. For instance, HAT-P-65b and HAT-P-66b are about 5.46 billion and 4.66 billion years old, and their stars are about 84 and 83 percent through their life spans, respectively. Stars grow brighter as they approach the end of their time on the "main sequence" — that is, the most stable parts of the lives of those stars. The researchers suggest that as stars get older, they reinflate planets orbiting near them. "Hot Jupiters apparently get bigger as they age," Hartman told Space.com. Until now, researchers did not have compelling evidence that hot Jupiters were actually getting bigger over time, as opposed to the possibility that researchers were looking at hot Jupiters that were simply born larger than expected, Hartman said. This new finding "has major implications for our understanding of how planets form, how they evolve over time, and the physical processes at play inside of these planets," he said. In the future, Hartman said, he would like to investigate the exoplanets of stars that have aged off the main sequence (the longest stage of life for a star) to become bloated, giant stars. "I would love to see whether gas giants on wide orbits, like our own Jupiter, become extremely inflated when they are significantly heated by the host," Hartman said. This would let researchers know how quickly planets react to changes in stellar radiation, he said. The scientists detailed their findings in the December issue of the journal Astronomical Journal. Editor's Note: This article previously stated that these puffed up hot Jupiters both have masses equal to about 1.2 times the mass of the sun; it is the exoplanets' parent stars that are 1.2 times the mass of the sun.